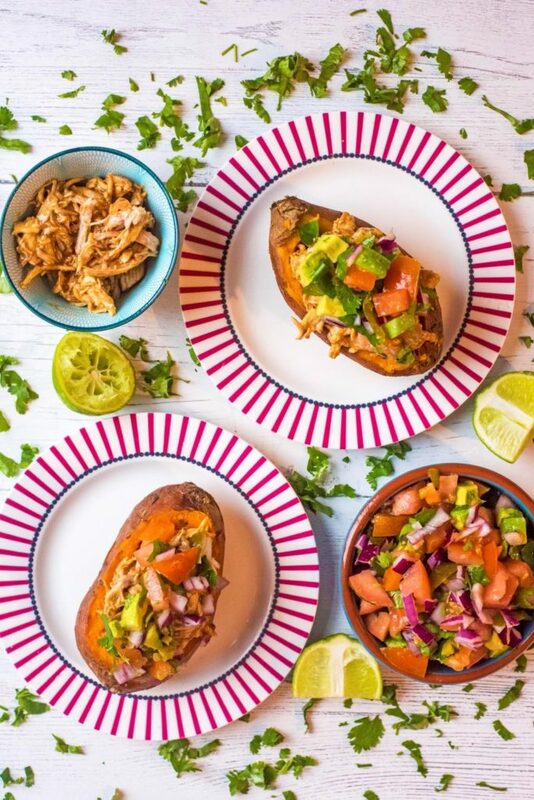 If you are bored with your regular baked potato toppings, then try something different with these BBQ Chicken Stuffed Sweet Potatoes that use homemade BBQ sauce and are topped with a refreshing avocado salsa. Is there anything more comforting than a stuffed baked potato? It was a staple back in my student days, but the fillings never really got any more adventurous than cheese and beans. Sometimes coleslaw if I was feeling particularly fancy. But they have always been a favourite lunch ever since, but we are just more creative with the fillings now. 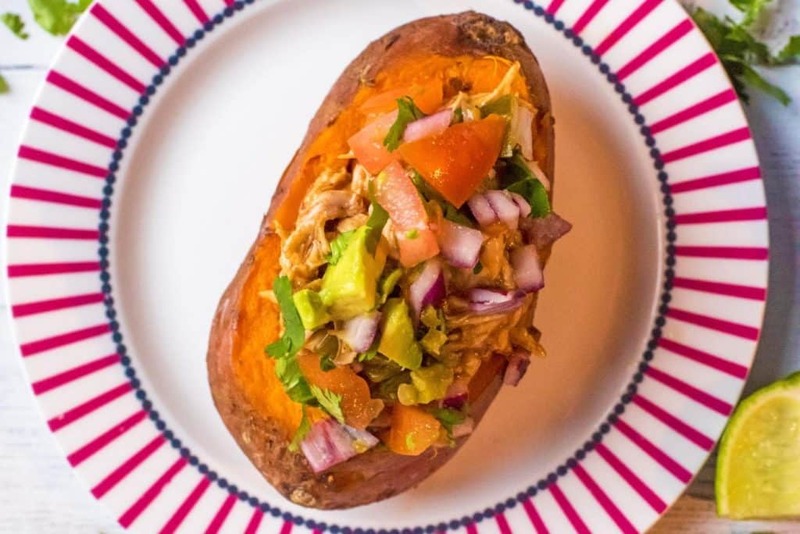 Do you want to be kept up to date on more delicious and healthy recipes like these BBQ Chicken Stuffed Sweet Potatoes? Please subscribe to the blog mailing list (it takes 30 seconds). You will get sent the new recipes straight to your inbox. Your email address won’t be passed on to anyone and you will never be spammed. This recipe was born out of having chicken leftover from a Sunday roast. So we shredded it up, mixed it with some homemade BBQ sauce (which we always have in the fridge because it goes on EVERYTHING!) and then put it in a sweet potato. Now we love it so much, we don’t just wait for leftovers to make it, and we cook up some chicken breasts to shred and make this. Cooking this dish really couldn’t be any simpler, and that is partly due to using Bacofoil® Non-Stick Kitchen Foil, which is something that we always have in our kitchen, as it’s used almost daily. Bacofoil® has been a household name with for over 50 years and their aim is to make our lives in the kitchen that little bit easier, and they have certainly done that with their Non-Stick Kitchen Foil. For a start, because it stops food sticking to the tray it saves on the washing up which is always a bonus in our house, as we both try to avoid it as much as possible. But what I really love is that because it is non-stick, you don’t need to use any oil or butter when cooking, which is a great way to save some calories. Think about all those things that you usually add oil to when cooking, so it doesn’t stick – like salmon or chicken breast. Well, now you don’t need to and that saves calories that you could save for dessert. Being Non-Stick it also ensures that your food looks like it should, no bits sticking to the tray, or foil. Also, one of our aims for this year was to do more for the environment, which is why we love that Bacofoil® is 100% recyclable. Now, as if BBQ shredded chicken stuffed in to a baked sweet potato wasn’t good enough, just look at what is on top of it. Avocado salsa! Now, if you haven’t made this stuff before, then you have been seriously missing out. It’s your basic pico de gallo salsa with chunks of fresh tomato, red onion, coriander, jalapeño and lime juice, but with some creamy avocado mixed through it. We love this on tacos and burritos, sandwiches and salads and now on top of baked potatoes too. It’s a great way to add some colour, which is a win for a food photographer. 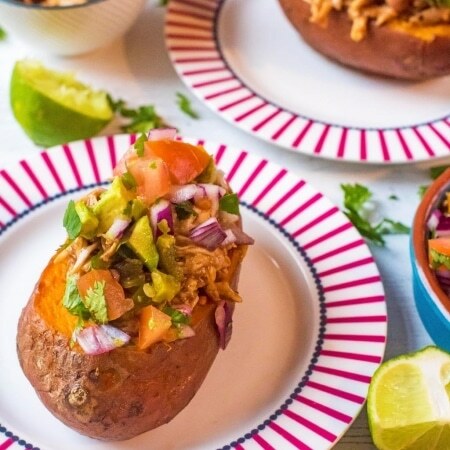 If you aren’t a fan of baked sweet potatoes, then this shredded BBQ chicken goes really well in a bread roll with some homemade slaw. Or in burritos. So many options! Have you tried our homemade BBQ sauce yet? I know it’s tempting to just buy a bottle of ready made sauce, as there is about a thousand on the supermarket shelf, but they have so much sugar in them. Not only do you get the satisfaction of having made the sauce yourself (that will wow any dinner guests), but it has less sugar and it still plenty sweet. You can also add your own flavours – ever tried chilli BBQ sauce? So good! Wash the sweet potatoes and pierce a few times. Wrap them in Bacofoil® Non-Stick Kitchen Foil and put them in a preheated oven at 190°C for around 50 minutes, or until they are cooked through. Put a piece of Bacofoil® Non-Stick Kitchen Foil on a baking tray and add the chicken breasts. Season with a little sea salt and black pepper and put in the oven with the sweet potatoes and cook for 40 minutes, making sure it is cooked through. Meanwhile, put all of the rest of the ingredients in a bowl to make the avocado salsa. Mix well and set aside. Once the chicken is cooked, easily remove from the non-stick foil and shred using 2 forks. Mix in the homemade BBQ sauce. Slice open the sweet potatoes and stuff with the BBQ chicken. Put on plates and top with the avocado salsa before serving. If you need more inspiration for baked potato toppings, take a look at our 10 Healthy Baked Potato Toppings. They look absolutely mouth watering. Defiantly on the to do list. Thanks for sharing. This chicken stuffed sweet potatoes looks really delicious. I will definitely give this a try. Yummy! These look so delicious, I must try this recipe, thanks for sharing. I also use Bacofoil, it is ideal for cooking. I loved filled potatoes and filled sweet potatoes are even better! I’ve only attempted this sort of thing once and it was a mess but I’ll have to try again with this combo! 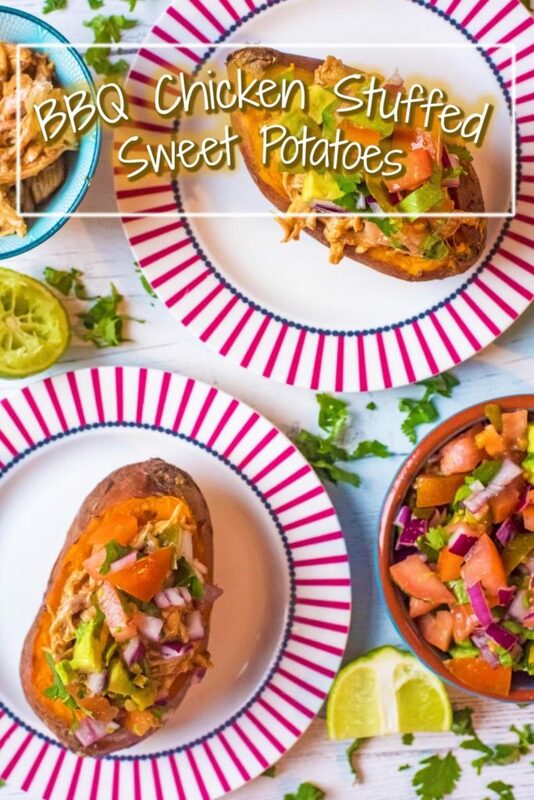 This recipe sounds so delicious, I love sweet potatoes and they are so much healthier than normal ones. I also always use foil when I bake something in my oven. I keep meaning to try sweet potatoes instead of normal potatoes when baking them. I use Bacofoil when cooking them too, works perfectly!